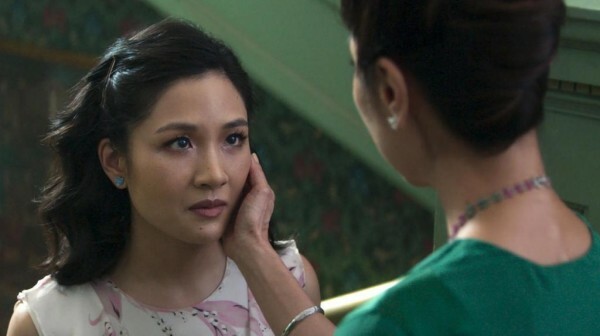 The newsworthy aspect of Crazy Rich Asians is that it's a potentially profiitable Hollywood movie representing an important but largely ignored minority. As Black Panther was remarkable for being a superhero picture with an all-black cast, Crazy Rich Asians - something much more unusual - is a big mainstream rom-com with almost nothing but Asians. Asians rarely appear in American movies at all, and there are so few known Asian movie actors in Hollywood, the Korean-born John Cho of "Harold & Kumar" fame seems to get every kind of Asian role. There doesn't seem to have been a popular US film featuring Chinese people since Joy Luck Club twenty-five years ago. Most of the Asians in this American movie are not Asian Americans, but that may not matter. The anchor of the movie is an almost Jane Austen-style story of a "single man in possession of a large fortune" who is "in want of a wife," and a romance of challenged love due to family problems when the man in question takes his "ABC," American-born Chinese girlfriend, to his native Singapore to attend a wedding. The beautiful Rachel (Constance Wu) and impossibly buff and handsome Nick (Henry Golding, who's actually English and Malaysian but cast as Chinese) both teach at New York University. Her field is economics, focused on game theory (implying, no doubt, her skill in a potential contest, which she shows in a nicely filmed game of mahjong). Nick's field is vague, as, for Rachel, to begin with, is his family background. The wedding is of of Nick's boyhood friend Colin (Chris Pang) and fiancée, Araminta (Sonoya Mizuno), and Rachel will also meet Nick's famous and unhappily married fashion-plate cousin, Astrid (Gemma Chan), and the rest of the family. An essential idea of the movie and of Kevin Kwan's source novel on which the movie is based (a bestseller with two sequels since 2013) is a contrast between good taste and crass excess, but this is a distinction both movie and novel lose through reveling in vulgar display, the higher consumerism of luxury brands and designer stuff, as well as anything that shows off that you have a lot of money and relish spending it to impress others. This movie is a constant succession of gleefully out-of-control set pieces for which the preparations for a wedding are a good excuse. The parties and events staged chez Young are as excessive and borderline tasteless as anything nouveau riche you could possibly imagine. The difference between the movie and the source book seems to be the book's even greater quantity of name-dropping, and displays even this ambitious, overcrowded film couldn't manage. There is something very gay about this, and indeed there is a gay Young family member (Nico Santos) who acts as an insider voice. The people are standard issue. All the men, if not little and fat and definitely or probably gay and presented as comical mascots, are all handsome, big, tan, and buff, and Nick and his male contemporaries are frequently displayed shirtless for no particular reason, the way glittering gowns, prestige watches and fabulous jewelry are shown off. If director Chu wanted to produce a Far Eastern extension of Lauren Greenfield's films about conspicuous consumption, this is a great start. Crazy loves excess and winds up relishing the sight of things that ought to be meant to symbolize bad taste and rampant materialism. This movie is overstuffed with one big scene after another staged for spectacle, some of them ribald celebrations staged by a character called Bernard Tai (Jimmy O. Yang, Jiang Yang in the TV series "Silicon Valley"), who becomes a sort of master of revels here, nearly devoid of dialogue. Had the cloying, spectacular crowd scenes been cut back a bit, the actual story could have had more attention, though it might be a fantasy to imagine a subtler and wittier movie would have peered out. But restraint never gets a chance nor does the critical eye of satire. What emerges is that Nick's mother Eleanor (Michelle Yeoh, formidable), whose own status is complicated, becomes a big obstacle to Rachel's acceptance by the Young family. In large part, though cold and forbidding, her attitude is admirable and an assertion of traditional values superior to mere consumerism or crassness. A possible arbiter is Nick's grandmother Ah Ma (Lisa Lu, a star of Joy Luck Club), the grande doyenne, who raised Nick. Her admiration of Rachel's nose may turn the tide in her favor. Or will it? The movie's ending, rushed and not very convincing, is happy. The whole second half has been devoted to showing how invincible the obstacles are - only to cast them aside at the last minute. Several super-valuable pieces of jewelry play a role in the ending. I didn't buy it - but then, I couldn't afford to. "It's not a movie, it's a moment," director Chu was quoted in the Guardian as declaring about Crazy Rich Asians at an advance screening, and that may be a good way of putting it. This isn't much of a movie; it's more a gaudy bauble. It may be a moment. But I'd rather see more good movies featuring Asians. After all, Asia has so many of them, from China, Taiwan, Hong Kong, Japan, Korea, Malaysia, Indonesia, the Philippines and Thailand, all of which in the past year produced better films than this one, as I saw in covering the New York Asian Film Festival. I know I am being a spoilsport about this movie, which may indeed help Asians gain recognition in American film, but its crass materialism is too much a part of a wave going right to the top of American life, where the individual Spike Lee refers to as Agent Orange has stolen the top spot. I don't need to be reminded on screen that Asians can be glamorous, elegant and beautiful, as well as filthy rich. I know that. I want to get to the part where they are intelligent and have interesting lives. Maybe in time that can come, even from mainstream Hollywood, but it looks a long way from here. Crazy Rich Asians, 120 mins., premiered 7 Aug. 2018 at TCL Chinese Theatre, Los Angeles. Released in many countries, including the US, 15 Aug. UK release 2 Nov. Metacritic rating 74%.